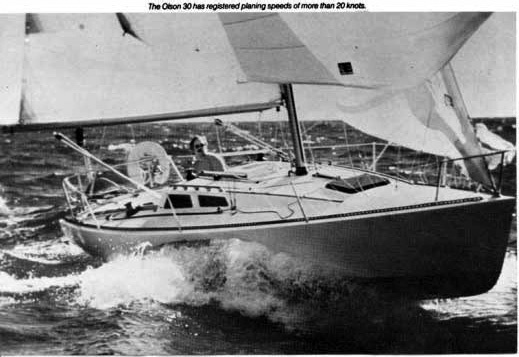 The Olson 30 has become one of today’s “hottest” ocean racing sailboats. 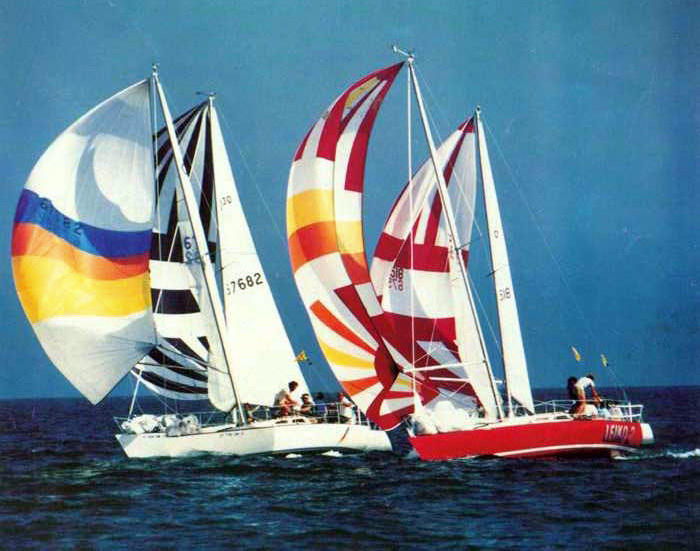 A product of Pacific Boats, Inc., Santa Cruz, California, this exciting craft has won a multitude of races. It has been tested for strength, going to weather for hours in 60-mile-per-hour winds, and has registered planing speeds of more than 20 knots. The Olson 30 is constructed as a structural sandwich —both the hull and the deck — with skins of fiberglass on either side of CONTOURKORE® end-grain balsa, a product of Baltek Corporation. “The most important factor in using balsa core in a structural sandwich is the safety it provides the owner. We explain in detail to our customers how we build our boats and why this construction makes it safe. We show them that balsa is a closed-cell material, and that we hot coat both sides to seal it. Even if water does get in a hole, it is not going anywhere; all the holes that go through any of the cells are sealed with resin. We tell them how the two surfaces of the balsa and the glass are 100% bonded. “This type of construction is extremely stiff, providing our design with maximum performance characteristics. All the forces that are working on the boat are translated into making a forward motion, as opposed to the forces of the boat working against themselves (oil canning, twisting, deformation of shape, all of which slow a boat down). This assures more stability in the water and better control of the craft while underway. “Why not foams? We have tested synthetic foams extensively, but never put them in a boat. We found, in testing, that under point compression loading, foams crack and fracture the skin on one side, as compared with the balsa core. A fracture might go all the way through a balsa/FRP sandwich, but it takes a lot more force to do so than with foam. The main difference is that if a balsa core is damaged, you can pinpoint the area. Synthetic foam damage, on the other hand, is extremely difficult to pinpoint. On one side of the laminate you may see a fractured gel coat, but on the other side it could look perfect. It would look like the simplest thing in the world to repair, but when you look at it head-on (cross-section), you will see that the foam was totally sheared into two pieces. “A balsa/FRP sandwich has amazing strength. We did impact tests on both foam and balsa core, with the balsa maintaining nearly 100% of its structural integrity at the point when structural failure was resulting in the foam. The Pacific Boats production shop is a model of precision planning and teamwork, with no details overlooked in making their boats as top-performing, strong, consistent, and cost efficient as any in the industry. The use of templates for cutting the CONTOURKORE for the fully-cored hull and deck avoids waste of the 2’ x 4’ sheets and reduces cutting time. Because the boat is symmetrical, the use of one template suffices for both sides of the boat, whether hull or deck. Once all the balsa sheets are cut, they are coded for position, stacked (scrim side down) and a coat of resin is rolled on them as thinly and evenly as possible. This “hot coat” prevents the wet laminate resin from penetrating too far into the balsa during vacuum bagging. A gel time of 15-20 minutes is used to attain as rapid a cure time as possible; ideally, the balsa is left overnight to cure completely. All cut sheets have a final fitting with any excess being trimmed to ensure a complete tight fit. Using a felt tip pen, lines are drawn around all the parts as they lie in the hull or on the deck. One-ounce mat is used for adhering the balsa core to the woven roving laminate. The hull mat is cut the complete length of the hull, while the mat for the deck is cut to each individual template since only horizontal sections of the deck are balsa cored and the shapes are complex. While this is underway, the first laminate is sanded and any high spots removed. This is necessary to ensure complete bonding between the fiberglass and the balsa core. The vacuum bagging at Pacific Boats is accomplished with the timing and attention to detail of an America’s Cup crew. All materials and procedures are followed with extreme precision and care. 1. With all the mat pre-cut to fit deck or hull, a general vacuum-forming sealing tape strip is run around the edge of the mold and on the deck around the hatch and cabin. 2. “Frogs,” as the openings for the vacuum hose are called, are prepared and sealed with tape. When working with the bed coat, the gel time is set for about 30-40 minutes. Under no circumstances does it exceed 50 minutes. According to Hap Laurila, supervisor, laminating area, “It is important to have everything ready before starting the bagging procedure -frogs, tape, hoses, valves; when we go, we cannot stop to wait for any item. 3. “Once the mat is positioned accurately, the resin is added, rolled out, and the CONTOURKORE core is placed in position. All edges are checked to be sure that no overhang exits. 4. The ‘frogs’ are set, with one exhaust port on the deck itself and one under the cockpit area. In the hull, one ‘frog’ is set one-third of the way into the hull and another one-third toward the bow. 5. “Simultaneously, flow directional lines (¼-inch poly propylene rope) are snaked around the deck and hull to create an air channel. They all lead directly to the frogs. They provide passageway for the air to the vacuum hose so that all air can be pulled out from between the balsa core and the wet mat. This results in solid bonding between the two surfaces. 6. “The protective paper covering on the vacuum sealant tape is removed. 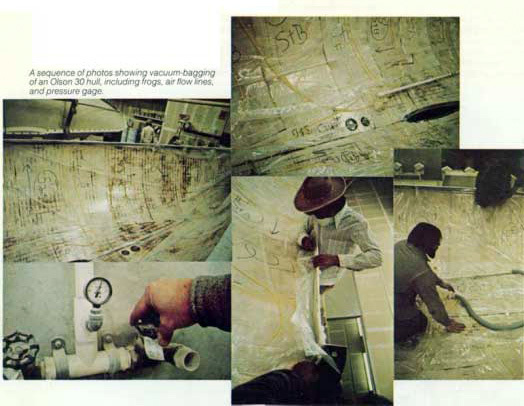 Installation of the polyethylene sheeting begins by draping it over and in the mold. The crew starts at the bow and goes around the mast step and hatch and up the cabin sides. Three pieces of sheeting are needed for the deck. Where one section meets the next, the gap is sealed so that no air can escape from the seam. There are areas around the edge that will form into excess “pleats” because of some excess of sheeting. These are sealed with vacuum bag tape, also. 10. The final layers of mat and woven roving are then applied to the core and the deck (or hull) is ready to be popped from the mold and assembly production begun. SPECS: Polyethylene sheeting: 4 mil clear, uncoated: Monsanto. Sealant tape: 1/8 x ½ GS 43. General Sealant of City of Industry, Calif. Polypropylene line: 1/4 Gast Vacuum pump, capacity 40 cfm.